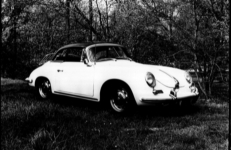 We're all familar with the Removable Factory Hardtops made for 356 Porsche Cabriolets beginning in Model Year 1958, which started in September 1957 with the introduction of the T-2 body, and the first Cabriolets with vent windows. 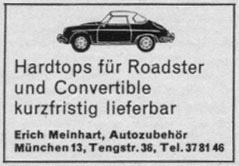 From that point on, removable hardtops became a regularly offered factory accessory for 356 Porsche Cabriolets. 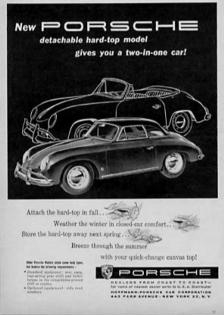 But a few years earlier, a number of after-market manufacturers started making removable hardtops for the Porsche 356 Speedster. Little is known about most of these companies other than they existed in the 1950's and 60's and advertised in major car magazines such as Car & Driver, Road and Track and Sports Car Graphic. And few know that there were more than one or two non-factory hardtop manufacturers, some in Europe, and many in the USA. This website will present some interesting information about both the factory hardtops, and those made by after-market manufacturers. 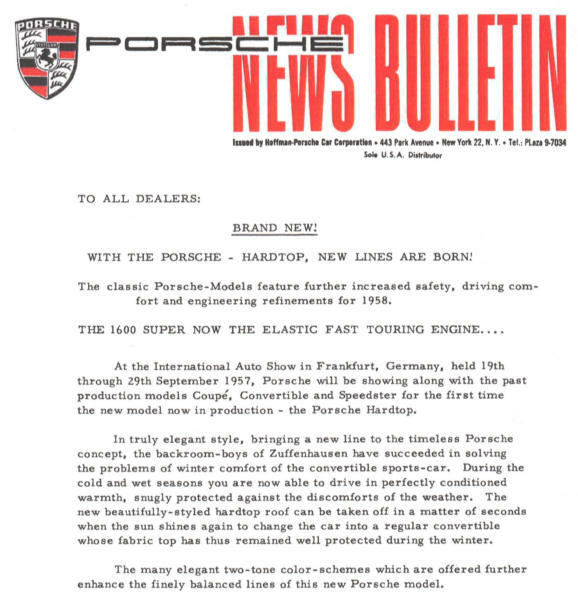 Hoffman-Porsche Car Corporation "News Bulletin", September 1957. 1. Porsche Factory Hardtops, Stuttgart, Germany. soft tops) and a bolt plate behind the doors. 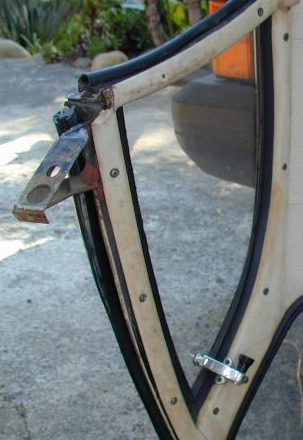 This made removal a relatively simple process." 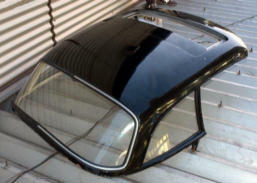 Factory Removable Hardtop on a 356-A Cabiolet. 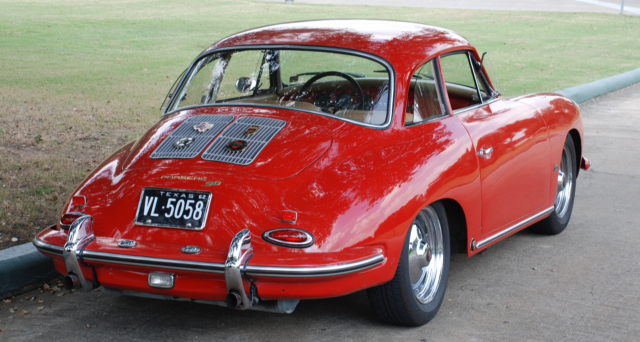 The Removable Hardtop Option was first available for the 1958 model year, and was listed in the 356-A factory Accessory Catalog dated February 1959 at a price from the factory of around $170.00. A factory booklet (shown below) was published in March of 1958 giving instructions for installing and removing the hardtop. In most cases, removing and installing a factory hardtop is a two man operation. The hardtop is quite heavy and cumbersome and difficult to work with for one person, but it is possible for one person to remove and install a hardtop if that person is really determined. How do I know! The 356 B/C Factory Workshop Manual also has directions with pictures for installing and removing the hardtop, see pages B48 to B51. No mention is made of the hardtop in the Owner's Manuals. The above is the inside portion of the Factory Sales Brochure dated 10/57! Instructions for installing a Removable Hard Top on a Cabriolet, 3/58. 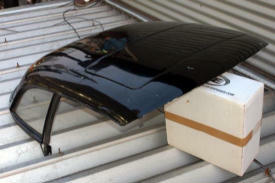 Above is the preferred method for installing or removing a hardtop! The early removable hardtops had fixed rear quarter windows. 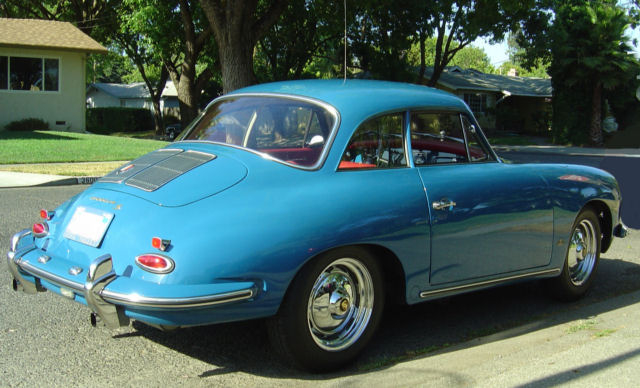 This changed later in the 356 series, with rear quarter windows that "popped out" like those on 356 Coupes. 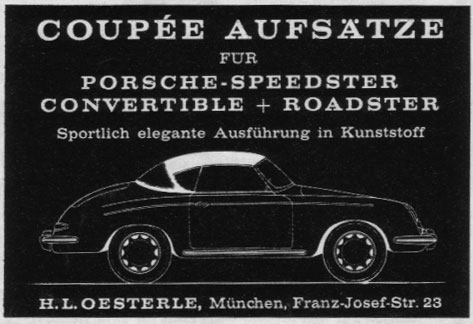 356-A Cabriolet with Removable Hardtop. Comparison of 356-A Carrera Cabriolet w/Hardtop and a 356-A Cabriolet. Freddy Rabbat's 1959 356-A Carrera Cabriolet with Factory Removable Hardtop! Factory Removable Hardtop on a 356-B Cabriolet. Instructions for installing a Removable Hardtop on a Cabriolet, 4/61. 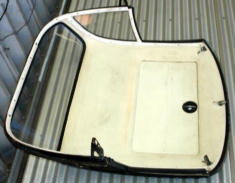 Image below shows the Removable Hardtop on a 356-B T-5. Image above shows the Removable Hardtop on a 356-B T-6. Did you know that you could have ordered a factory removable hardtop for your Cabriolet THAT HAD A BUILT-IN SLIDING SUNROOF? Yes! 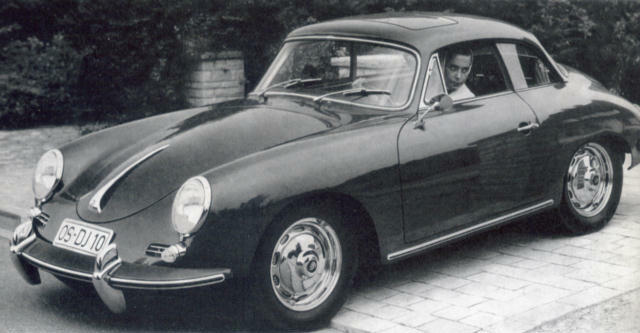 It was available for the 356-B T-6's and was shown in the September 1961 factory accessory catalog. Bet you don't see many of these around! One of these special removable hardtops would be the "Ultimate Option"! 356-B T-6 with Removable Hardtop. 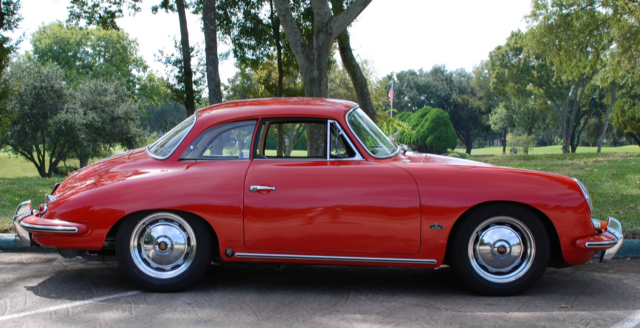 All 356 Porsche factory hardtops were made by Reutter! See the "bolt plate" and the "pop-out" window! Each Reutter removable hardtop has an individual serial number plate, and a "Farbton Nr." or "Color Number" plate, just like each 356 Porsche chassis. 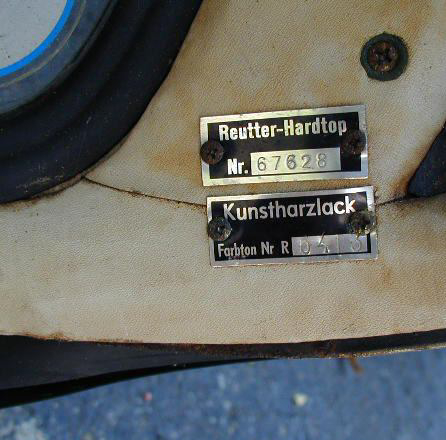 And NO, the removable hardtop serial number is not the same as the chassis number! Check it out! Some Removable Hardtop #'s correlated with their original chassis #'s! Information developed by Freddy Rabbit on the 356 Registry Forum! Exploded-View Part Diagram: Page 8/5 from 356-B T-6 Parts Book! There is no Exploded-View Part Diagram which shows the Removable Hardtop with either the Sliding Sunroof Option or the Pop-out Rear Windows. There is reference in the 356-C Supplement Parts Book to the various parts these two options included with part numbers and descriptions, but no part diagram. Catalog of Colors, Carpet and Upholstry Samples" for 356-C's! 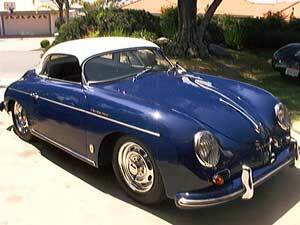 356-B with Removable Hardtop v. 356-B Hardtop/Notchback! 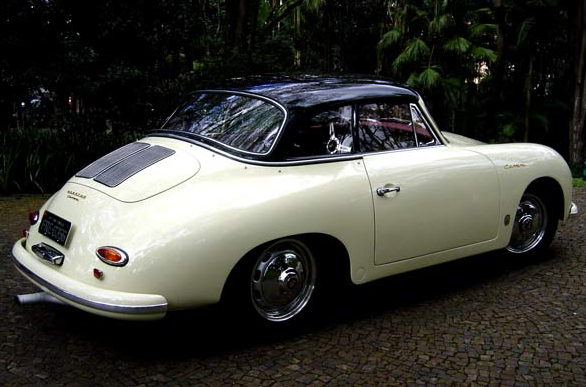 There's a lot of confusion regarding the term "Hardtop" as it applies to 356 Porsches. 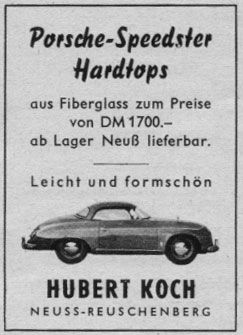 On one hand the term "Hardtop" was used to refer to an Optional Removable Hardtop made available by the factory as an accessory for 356-A Cabriolets beginning in Model Year 1958. On the other hand, the term "Hardtop" referred to a Cabriolet that was ordered with a removable hardtop instead of a soft convertible top. Even later, the term "Hardtop" was used to refer to an entirely new model which was otherwise known as the "Notchback" or "Hardtop 61" or "Karmann Hardtop" which looked like a Cabriolet with a permanently welded-on removable hardtop. Below is a history grid showing the time sequence of this confusion. A comparison of a 356-B with a Removable Hardtop and a "Hardtop 61" or "Notchback" reveals the obvious. They look very much alike! 356-B with Removable Hardtop compared to 356-B Hardtop 61. The Rare 356-B T-6 Twin Grill Notchback! A beautiful example of a 356-B T-6 "Twin-grill" Notchback! 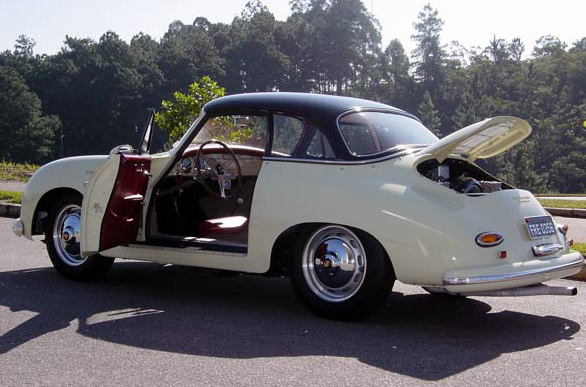 Here's another beautiful example of a 356-B T-6 "Twin-grill" Notchback, owned by Mark Roth! When you look at the lines of the cars in the beautiful pictues above, your REALLY begin to appreciate the Notchback! Hardtops/Notchbacks could be ordered with a Sunroof! Karmann ad in Christophorus Magazine #36, November 1961! Reutter and Factory Ads for the Removable Hardtop! 2. Glasspar, Santa Ana, California, USA. Glasspar, famous as a boat maker, manufactures Hardtops for the 356 Speedster. Glasspar top required Side Curtains. Glasspar Hardtops for 356 Speedsters first appeared sometime in 1955. 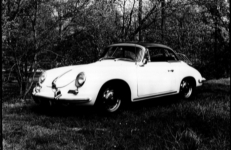 The original Glaspar Company was mentioned in the book "Excellence was Expected" by Karl Ludvigsen: "Hardtops had been in the Porsche picture earlier (than 1958), but not for the cabriolet model. They had been built privately by and for owners of the Speedster to replace its less-than-elegant standard canvas top. California's Glasspar began offering a fiberglass hardtop for the Speedster in 1955, and by early 1957 it was approved by the factory, and offered for sale through all Porsche distributors. It was priced at $285 in the United States and a little more than $300 in Europe." Glasspar is best known for pioneering work in the production of fiberglass boats. If you "Google-up" Glasspar, you can find the whole story. Producing removable hardtops for sports cars must have been just a sideline, as apparently they are no longer in the business. Further investigation has revealed that Fibersteel now continues to make Glasspar hardtops as "High Quality Reproductions", and they are formally authorized to do so by the original manufacturer. Below is a "non-advertisement" for Fibersteel, who provided the pictues shown below. and Assistance From Mr. Bill Tritt, the Founder of The Glasspar Company. Below are a couple of examples of Fibersteel's current Hardtop for Speedsters! 3. Erich Meinhart Autozubehor, Munich, Germany. the January 1963 issue of Christophorus magazine published by Porsche. 4. H. L. Oesterle, Munich, Germany. Removable Hardtops for Speedsters, Convertibles, & Roadsters! 5. Hubert Hoch, Neuss-Reuschenberg, Germany. Glasspar folder in Item #2 above. Also note the wire wheels on the Speedster in the above picture. 6. Plasticon, Pasadena, California, USA. 7. Steven's Plastics, Los Angeles, California, USA. 8. Astro Fiberglas Company, S. El Monte, California, USA. 9. Plastics Dynamics Inc., Compton, California, USA. 10. DerWhite's own 1965 356-SC Cabriolet with Factory Removable Hardtop! Click here for "Rebuilding Zenith 32 NDIX Carburetors"! New Book, 8.5 x 11 Spiral Bound, 93 pages, 150+ photos, All Color, with step by step rebuild instructions! Click here to see DerWhite's NEW Sales Literature Book! 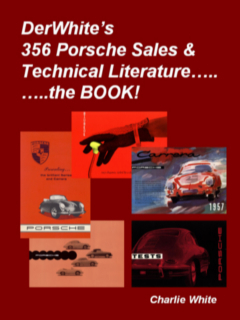 This website was designed for educational purposes to document the history of advertising materials for 356 Porsches 1950-1965, and was created on 9/23/2007, and updated with additional material on 2/18/12. More info to be added, come back and see! The images on this website are copyrighted. Some images come from various places on the internet. If you are the owner of an image and wish it to be removed, contact the author at the above email address. These images may not be used for any purpose without the written permission of the owner.